New Zealand Labor Party leader Jacinda Ardern addresses a press conference at Parliament in Wellington, New Zealand (Oct. 19, 2017). Thanks to an unexpected coalition, Labor’s Jacinda Ardern is New Zealand’s new prime minister. Proof that economics does not always rule politics has come from New Zealand, with 37-year-old Labor leader Jacinda Ardern installed as prime minister on the backing of a minority party. In a sign of financial market disapproval however, the Kiwi dollar posted its biggest fall in five months, with analysts fearing the economic impact of the new left-leaning coalition. The surprise announcement by kingmaker New Zealand First leader Winston Peters that his party was picking Labor as coalition partner, rather than the incumbent National party, was delivered as the nation sat down to dinner, around 7 pm local time. Peters had kept New Zealanders waiting for 26 days after the election, in which Bill English’s center-right Nationals finished with 44.4 percent of the vote compared to Labor’s 36.9 percent, with New Zealand First securing 7.2 percent and the Greens 6.3 percent. The result gave National 56 seats, down four from its tally under former leader John Key. In contrast, Labor gained 14 seats, claiming 46, while the Greens lost six seats, leaving them with eight. Peter’s populist party lost two seats, coming in at nine, but still had the power to make or break the new government. English said after the election that based on preliminary results, “just short of half of New Zealanders voted National and 10 percent more than our nearest rivals.” However, the Greens’ leader, James Shaw, said the nation of 4.7 million had “overwhelmingly voted for change” after nearly nine years of conservative rule. Peters appears to have agreed. After holding negotiations with both National and Labor, Peters told reporters Thursday that his party’s decision “represents the majority.” An economic slowdown is looming and capitalism must “regain its human face,” he said. Peters’ decision has made Ardern the nation’s second youngest ever prime minister and its third female leader. Somewhat incredibly, she will claim the top job after just two and a half months as Labor leader, ending National’s hopes for a fourth term in government. The New Zealand First leader is expected to become deputy prime minister in the new government, with his party holding four Cabinet positions. “This is an exciting day. 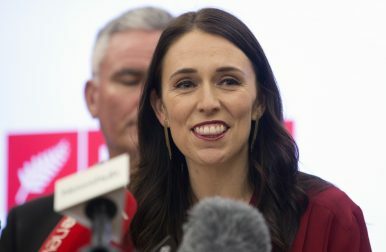 We aspire to be a government for all New Zealanders and one that will seize the opportunity to build a fairer, better New Zealand,” Ardern told reporters. However, financial markets were less excited, with the New Zealand dollar slipping initially on rumor that Labor could form government and sinking even lower on the official announcement. The kiwi fell as much as 1.6 percent to 70.38 U.S. cents, with investors concerned about potential changes to the Reserve Bank of New Zealand’s (RBNZ’s) mandate among other policy shifts, including cuts to immigration, restrictions on property sales to foreigners, and a new capital gains tax, along with increased public spending. “In addition to the unknown quantity this creates, the broader macro environment is turning, with growth patchy, inflation subdued, and signs dairy prices are also turning down,” he told the financial news service. “We have highlighted before that the polices of the Labor and New Zealand First parties are more likely to lead to slower GDP [gross domestic product] growth than otherwise as they involve reducing net migration by more than the National party, imposing stricter restraints on housing market activity and running tighter fiscal policy,” Paul Dales, chief Australia and New Zealand economist, said in a research note. “We won’t know what policies the coalition has agreed [on] until early next week. But the larger caps on net migration advocated by Labor and NZ First would most probably result in a sharper fall in dwellings investment than otherwise. Labor has argued for the central bank to include a pledge to achieve full employment along with its price stability mandate. Should the new government select a new RBNZ governor in March supportive of its shift, “monetary policy would presumably be looser than otherwise,” Dales said. English had pledged during the election campaign to cut taxes, maintain free markets and “flexible” employment regulations. The latest GDP data showed the world’s 53rd largest economy was on track for a ninth straight year of expansion, with GDP growth above 3 percent forecast for 2018 and 2019 by RBNZ. In August, English’s government more than doubled its budget surplus forecast for fiscal 2017 to NZ$3.7 billion (US$2.6 billion), boosted by increased corporate tax revenues. However, it cut its projected GDP growth forecast for the year to June to 2.6 percent from 3.2 percent previously, amid a drop in construction. “The economy is in pretty good shape, actually… since the GFC [global financial crisis]. That presents a very good opportunity for an incoming government, and I hope they take it,” English said. The change of government could also influence regional talks aimed at reviving the Trans-Pacific Partnership Agreement, with the new government seen seeking renegotiations to allow it to ban foreigners from buying New Zealand land. Despite a Trans-Tasman row during the campaign over the New Zealand nationality of an Australian lawmaker, Australian Prime Minister Malcolm Turnbull was quick to congratulate the new Kiwi leader. “Look [forward] to seeing you soon and building our two nations’ great partnership,” Turnbull tweeted. For political and economic historians though, the result indicates that Bill Clinton’s famous slogan, “It’s the economy, stupid” does not always hold true with voters. Having won Peters’ support, Ardern is about to face a much bigger challenge in winning over nervous investors.